This addition to the owner's childhood home nearly tripled the floor area and created dramatic new living areas and a functional floor plan on a beautifully landscaped site. The owners, avid bicyclists and environmental activists with 2 young children, desired a home that would hold to sustainable building principles and accommodate their lifestyle needs. The layout provides space for an orchard and garden and courtyard for socializing. Inside, south-facing clerestory windows wash the space in light and harness solar energy for warmth. Exposed wood detail and bright colored walls, personalized with art, add to a sense of comfort. 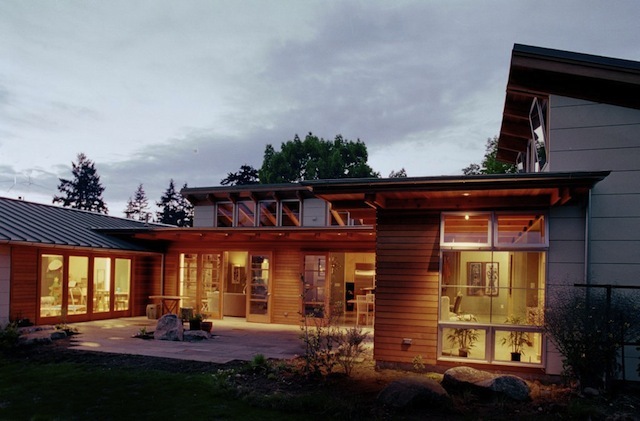 This project was featured in the July 2005 issue of Northwest Home & Garden.